Updated: Nov. 15, 2016 at 9:11 p.m. This post was written by reporters Meredith Roaten and Avery Anapol. Roughly 400 students walked out of class at 3 p.m. Tuesday, joining a march to the White House in protest of President-elect Donald Trump and later presenting several demands to University administrators to support marginalized students on campus. The protest was part of a nationwide walkout movement organized and spread on Facebook. GW was one of more than 35 universities who signed on to the event, according to a Google Doc outlining instructions for participating universities. D.C. high school students also organized a walkout today, leaving their schools around noon to protest at Trump International Hotel, The Washington Post reported. At least 10 student organizations participated to organize the event, including Our Revolution GW, the Feminist Student Union, Black Women’s Forum, GW Native American Student Association, Students for Justice in Palestine and Fossil Free GW. Representatives from the involved organizations worked together on a list of demands that protest leaders delivered to administrators at Rice Hall upon returning to campus from their march to the White House. Logan Malik, a member of Fossil Free GW, chairperson of the Student Association’s student life committee and one of the walkout’s lead organizers, said the demands – which ranged from requesting protection for minority students to divestment from fossil fuels – were similar to those put out by the national movement, but modified to be more GW-specific. The demands are suggestions for university administrators in the effort to create a “sanctuary campus,” or a campus that is deemed safe for students of color, immigrants, undocumented students and members of other marginalized groups. D.C. Mayor Muriel Bowser also released a statement Monday reasserting D.C.’s status as a sanctuary city. The list of about 15 demands includes increased funding for the Multicultural Student Services Center, commitment to protecting the privacy of undocumented students, workers and their families, increasing resources and financial aid for low-income students and students of color, increased acceptance of Palestinian students, divestment from “unethical” corporations and condemnation of anti-Semitic and Islamophobic activity on campus, among others. While the protesters waited in Kogan Plaza for more students and faculty to join and the walk to the White House to start, various students used a megaphone to lead chants, share experiences and energize the crowd. Infither Chowdhury, a member of the Muslim Students Association and one of the event organizers, said that the group that helped coordinate the movement knew non-violent protest was the best way to make a statement. “We continue with the national movement in trying to make sure that our students on campus from marginalized communities know that are people here on campus that are working with them and for them,” he said. Dean of Student Affairs Peter Konwerski said that administrators, faculty and staff became aware of the plans for the walkout on Monday night. 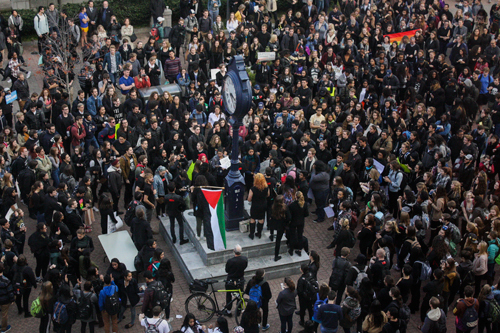 The students and faculty participating in the march left Kogan Plaza around 3:45 p.m., with Metropolitan and University police department escorts. The group marched down Pennsylvania Avenue chanting, “Ain’t no power like the power of the students, ‘cause the power of the students don’t stop!” and “Show me what democracy looks like! This is what democracy looks like.” They arrived at the White House around 4:15 p.m., where at least five students took turns at the megaphone. Elizabeth Ogunsanya, a first-year medical student, shared her experience as a black woman in the medical school, saying that although her class has 140 students, she can count the number of black students “on both hands.” She said that although students of color work just as hard as white students, they do not get the same amount of credit. Ogunsanya said that as a medical student, she fears that a Trump presidency would result in more women coming into the hospital with injuries caused by illegal abortions. “I haven’t slept in a week because my heart is full of anxiety, my heart is full of despair,” Ogunsanya said. The students walked from the White House to around Washington Circle and ended at Rice Hall. Along the way, the protesters chanted “black lives matter” and carried signs, and were greeted by passersby filming and honking cars. UPD officers guarded the entrance of Rice Hall as the students arrived, but allowed three of the leaders to enter the building and present the list of demands to administrators. Students again took turns at the megaphone outside the building where most of the GW administrative offices are housed, some reading poems aloud and others speaking about personal experiences that empowered them to participate in the protest. Tara Fitzmartin, a sophomore, said Trump opposed all the values of the communities she represented but the protest gave her hope. “This is the sign that we needed for everyone on this campus, for the people who are scared that feel alone. We are with them and they know that now,” Fitzmartin said. Although the movement was large and prominent on campus, not all students were supportive of the walkout. Diego Rebollar, a freshman, said that while he supported the students’ right to assemble, he thinks it is disrespectful to walk out of class in protest. “I think it’s pretty disrespectful to all our parents who are paying a lot of money for us to go here, if you’re on financial aid, the donors who donate a lot of money for us to go to class and learn,” he said. Hunter Wilson, a freshman and member of GW College Republicans, said he hopes the protests die down as Inauguration Day approaches, and that liberals and conservatives can come together across ideological lines. The GW chapter of the Young America’s Foundation also voiced their opposition to the walkout via a statement released on social media.